For comparison this year, against that -37%, the second-biggest loss of trust was the -21% in Italy. Tied for the third-biggest and fourth-biggest loss were Brazil and South Africa, both at -17%. Tied for fifth-biggest and sixth-biggest loss were Colombia and India, both at -13%. However India still remained one of the four highest-trust nations, having been #1 in trust in the 2017 survey, down now to the #3 position this year. Last year, China was #3; so, China and India switched positions between 2017 and 2018. The -37% for America simply outclasses all those other declines; and so this trust-plunge in America is major news. At the very bottom of trust in institutions is Russia, which displays 36% trust in its institutions. Second-lowest is Japan, which displays 37% trust. The two lowest in 2017 were Russia, at 34% and Poland at 35%. Russia was at the very bottom both years because one of the four “Institutions” is NGOs, and “Trust in NGOs” ranged worldwide in 2018 from a top of 71% in Mexico, down to a bottom of 25% in Russia, and this Russian bottom is a stunning 12 points below the second-from-bottom, Germany, which is at 37%. By contrast, for example, “Trust in Government” was 44% in Russia, and is only 33% in the United States. Trust in Government is the highest in China: 84%. (That’s the highest-trusted of the four Institutions there; the lowest of the four Institutions there is NGOs: 61%.) 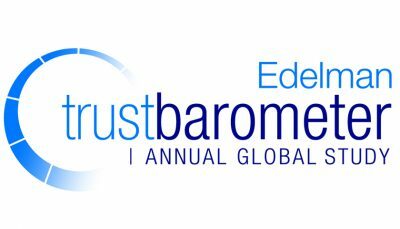 So: whereas the plunge across-the-board is record-shattering in U.S., the sheer lowness of trust in that one institution, NGOs, is (and has been) record-shattering in Russia, and perhaps these are the two main take-aways (or main findings) in this Edelman study. The four “Institutions” surveyed are: NGOs, Business, Government, and Media. The page “Trust Crash in U.S.” shows that, in the “General Population,” Americans’ trust in NGOs plunged 9 points from 58% to 49%; trust in Business plunged 10 points; trust in Government plunged 14 points; and trust in Media plunged 5 points. However, amongst America’s “Informed Public,” these figures are even drastically worse that that: down 22 points on NGOs, 20 points on Business, 30 points on Government, and 22 points on Media. Looking further into those figures: what has happened in the U.S. is that, whereas in 2017, America’s Informed Public had enormously higher trust in each of these four Institutions than did the General Population, now the Informed Public (which in all nations typically displays much higher trust than do the General Population) plunged down not only to below where the General Population’s trust-level had been in 2017, but even to below that, and is now almost as low as is that of the General Population. That’s a stunning plunge amongst the elite. So, Edelman’s reports noted for “Informed Public”: “23-point decrease: fell from 6th to last [28th] place,” meaning that the average decline on the four Institutions was 23%. Furthermore: “U.S. Trust in Media Diverges Along Voting Lines” so that whereas 27% of Republicans trust the Media, 61% of Democrats do. This is the biggest type of partisan divide shown. “Government Most Broken in the U.S.”: Whereas only 4% of Americans consider NGOs “broken,” and 7% consider Business “broken,” and 21% consider Media “broken,” 59% consider Government “broken.” In China, these figures are: 24% consider NGOs “broken,” 38% consider Business “broken,” 12% consider Media “broken,” and 10% consider Government “broken.” Though Russians place NGOs in the sewer, Americans place NGOs on a pedestal. That says a lot. “Media Now Least Trusted Institution” amongst all 28 surveyed nations. However, trust in the media is above 60% in three nations: China (71%), Indonesia (68%), and India (61%). 7 nations have less than a third of the population trusting their media: Turkey (30%), Australia (31%), Japan, Sweden and UK (32%), and France and Ireland (33%). Digging deeper into the “Media” issue: there has been, amongst the 28 nations, a movement away from online news (called “Platforms” by Edelman) toward traditional sources of news (called “Journalism” by Edelman): “While Trust in Platforms Declines, Trust in Journalism Rebounds”: trust in “Journalism” rose from 54% then, up to 59% now, and trust in “Platforms” sank from 53% then, to 51% now. This supports the view that the global campaign by “Journalism” (print and broadcast media) attacking “fake news” as being a product of “Platforms” (social media, search engines, and news aps) and not at all of themselves (such as the newspapers and TV that trumpeted “Saddam’s WMD” etc. and yet still are trusted as if they hadn’t been the ones spreading that pathologically fake ‘news’) has succeeded. In other words: ’news’ that is print or broadcast and thus can’t provide to its audience easy access to its sources being merely a click or two away, is more trusted than is online news, which can (and some of which sites actually do) provide such ability for the audience to check its allegations easily for themselves (merely by clicking onto a link). In other words: the public evidently don’t want to be empowered to verify allegations, but instead want ’news’ that they either can’t verify for themselves or would need to physically do their own personal investigation (not just by means of a click online) in order to decide whether or not to trust the purported ’news’. This shows that the billionaires, who control all of the traditional sources of ‘news’, will likely continue to control the ‘news’, perhaps even more in the future, than now. And it shows that the public, worldwide (at least in these 28 nations), want them to continue controlling the ‘news’. Independent online news-sites will thus likely be easy to crush. They aren’t even being called “Journalism,” no matter how much better than such “Journalism” the best of them might actually happen to be. “Trust in Platforms Decreased in 21 of 28 Countries” and there was the “Steepest decline in U.S.” So: especially Americans are increasingly trusting and getting their ‘news’ from the Establishment (which generally crave every invasion that the government is considering). “Uncertainty Over Real vs. Fake News”: 63% worldwide agree with “The average person does not know how to tell good journalism from rumor or falsehoods.” People are passive about that; they accept this personal incompetence that they attribute to themselves. The vast majority of people don’t know that all ‘news’ media that don’t require all reporters to link to any source that they’re using that’s online, should be distrusted and simply avoided, not relied upon (such as is increasingly being done). If there aren’t links provided to all reasonably questionable allegations, and if no quotations are provided of titles or key allegations that can conveniently be web-searched to find and evaluate its source, then that ‘news’ medium can’t reasonably be trusted — but it is instead trusted the most. Since there’s more trust in the non-verifiable print and broadcast ‘news’ media than in the verifiable online ones that do provide clickable links to their online sources, most of the public are satisfied to trust media on the basis of sheer ‘authority’, not on the basis of the reader’s open-mindedness and critical evaluation of every allegation. “Voices of Authority Regain Credibility”: Out of 11 types of “spokespersons” cited in ‘news’ reports, what’s most distrusted are “A person like yourself” (now rated “at all-time low”) and an “Employee.” What’s most trusted of all is a “Journalist” (presumably here print or broadcast) and what’s second-most-trusted is a “CEO” — these two (the mega-corporates) are trusted considerably more than, for examples, a “Technical expert,” or than an “Academic expert.” So: the mega-corporates don’t even need to cite their own selected and paid ‘experts’, and can just cut their costs, while retaining the loyalty of their (and even growing) following. That makes dictatorship so easy to do — even while cutting costs. “Employers Trusted Around the World”: this ranged from a low of 57% in Japan and South Korea, to highs of 90% in Indonesia, 86% in India, 83% in Colombia, and 82% in China. Obviously, CEOs are exceptionally high-status around the world. Employees, by contrast, are at or near the bottom. “Trust in Government” is the highest in China (84%), UAE (77%), Indonesia (73%), India (70%), and Singapore (65%). It is the lowest in South Africa (14%), Brazil (18%), Colombia (24%), Poland (25%), Italy (27%), Mexico (28%), and France and U.S. (33%). Here is that complete list, from the top, all the way down to the bottom: 84% China, 77% UAE, 73% Indonesia, 70% India, 65% Singapore, 54% Netherlands, 51% Turkey, 46% Sweden, 46% Malaysia, 46% Hong Kong, 46% Canada, 45% South Korea, 44% Russia, 43% Germany, 41% Argentina, 37% Japan, 36% UK, 35% Ireland, 35% Australia, 34% Spain, 33% U.S., 33% France, 28% Mexico, 27% Italy, 25% Poland, 24% Colombia, 18% Brazil, 14% South Africa. Since UAE is the very opposite of being a “democracy”, that cannot reasonably be considered to be possibly a rank-ordering of these nations according to the extent they’re a democracy. However, it might possibly be a rank-ordering of the extent to which the public are satisfied with their government; and, so, the complete list is shown here on that factor. “Trust in Business” is topped by Indonesia (78%), India and China (74%), Mexico (70%), UAE (68%), Colombia (64%), and Netherlands (60%). At the bottom on this are Hong Kong and South Korea (36%), Ireland (40%), Russia (41%), and Japan (42%). Canada and U.S. are in the middle: respectively #14 (49%) and 15 (48%). “Trust Declines in Nine Country Brands” (defined by “company headquartered in”) and by far the most decline of all (6% down, from 55% to 50%) was for U.S. products and services. The most-trusted brands shown (all rated 65% to 68%) are #1 Canada (same as last year) Switzerland (down 1% from last year but still #2), and Sweden (down 3% from being tied last year with Canada). The most-distrusted brands shown were India and Mexico (32%), Brazil (34%), China (36%), South Korea (43%) and U.S. (50%). Consequently, for example, any corporation that moves from U.S. to Canada, would, as of now, rise from being a 50%-rated national brand to being a 68%-rated national brand. Of course, such a trick would be more effective for a relatively new corporation, not for one that has already become widely known to be a U.S. brand. “Polarization of Trust” contrasts the “6 markets with extreme trust losses” (which are topped by U.S.) versus the “6 markets with extreme trust gains.” The latter group are #1 China +27%, #2 UAE +24%, #3 South Korea +23%, #4 Sweden +20%, #5 Malaysia +19%, and #6 Poland +17%. Those latter 6 are becoming places where headquartering a corporation there is adding significantly to the brand-value of that corporation’s products and services.